The Sclerotherapy or Microsclerotherapy procedure used at The London Vein Treatment Centre is designed for fast and effective treatment of thread veins with a minimally invasive procedure. The procedure is most commonly used for treating thread veins on the legs – including thighs, calves, knees and ankles. It is a proven technique which is highly effective; around (50%-80%) however there are a few contraindications. First and foremost, it is important to get a consultancy done from our vascular surgeons so that they can assess whether the patient is eligible for the procedure or not. 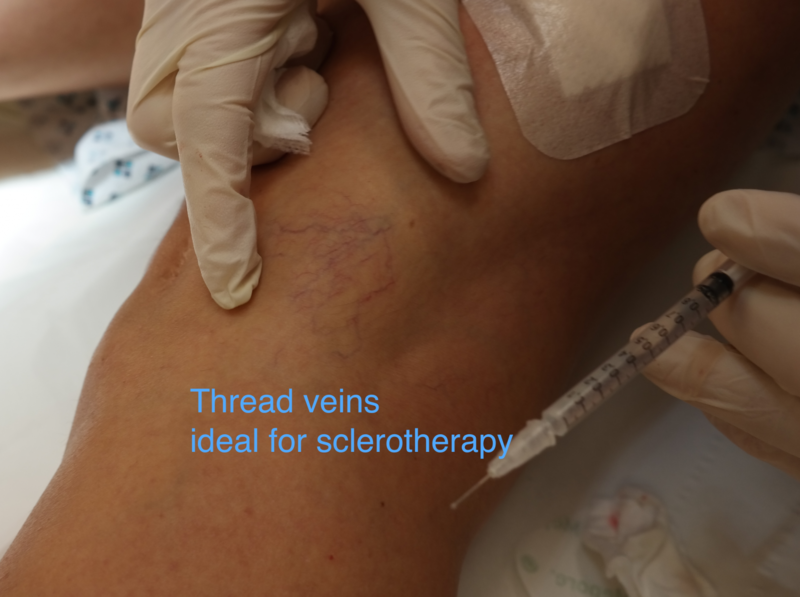 At the London Vein Treatment Centre, we treat thread veins by injection microsclerotherapy. Our specialist doctors insert a very thin needle into the extremely tiny vein and infuse a chemical that is called sclerosant. Through use of sclerosant, the inside of the vein is damaged, causing it to shrink back so that it is no longer visible at the surface of the skin. What to expect once Sclerotherapy is performed? Sclerotherapy is a safe and time proven procedure that causes extremely little or no discomfort at all. It can provide an overall improvement in your thread veins and once the treatment is done the patient can easily go back to their work and normal activities. Initially patients may be asked to wear stockings in order to keep the treated veins closed and to reduce bruising. Furthermore, you may sense that there are colour changes accompanied with small areas of scarring where the sclerotherapy is performed. Is this treatment suitable for you? If you feel that the thread veins on your face are unsightly and you have to use makeup to hide them or if you are embarrassed of wearing short clothes with people seeing your spider veins then you are suitable for this procedure. However, pregnant women, those on birth control pills, and those who have had a history of blood clots are advised against this procedure and may be better advised to consider a laser procedure. 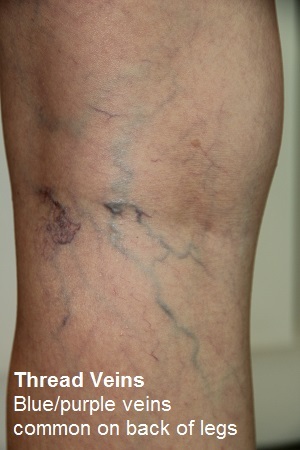 Blue thread veins on the backs of the legs are a common scenario. May be treated with sclerotherapy injections. Thread vein treatment with skilled doctors. Sclerotherapy or microsclerotherapy treatment is available at a choice of 5 clinics in London and Bristol.